If you’ve ever wondered how your favorite musicians got really good at what they do, the answer is: Creative and Fun Practicing. Yes, Practicing can be as creative and exciting as playing polished versions of tunes! And much, much more. This may be the most useful workshop you’ll ever attend, with dividends paid out for years to come. We've heard that using sheet music for klezmer is sacrilegious (sinful, disrespectful). But can it be done? This class will explore the ways that written klezmer sheet music can be misleading, and provide advice for what to do when faced with a piece of music that's written down (hint: we can do more than putting it in the recycling!). Playing in a band for a klezmer dance party is a fun collaboration between dance leader, dancers and musicians. Yet it’s rare when dancers, leader and musicians seem in sync. We will cover the main dance rhythms, and explore rhythmic techniques to put the necessary lift in the music to facilitate a lively dance party. Also: how to put together a medley, when to change rhythms, when to end the set, and developing signals between band leader and dance leader. “Speed-learn" klezmer music? Josh’s new teaching method promises to open your eyes to a completely different way to approach learning a tune. By the end of the session, students will not only play, but also understand and improvise in the traditional style. Money-back guarantee anyone who got in for free. Welcome to 2017 and a new series of klezmer workshops and jams. Thanks to the support of the Alliance for California Traditional Arts, we will be holding monthly such events in 2017! We welcome participants of all ages, on all instruments. Must be at least intermediate level on your instrument. Registration, including refreshments: $25 sliding scale, for participants. Listeners welcome, too! Donation requested. The San Francisco event will be an extended workshop with teaching by ear (sheet music provided after class) and an extended traditional jam, without sheet music. Rsvp to jams[at]klezcalifornia.org or on site. Please specify which event (date/location), your name, instrument, and any questions. To see sheet music and/or (slowed down) audio files, go to klezcalifornia.org/events/jams and scroll down. Material is already there for March 19. If you registration in advance, we will let you know when that event's files have been loaded. Images by Talia Shaham and Les Plack. 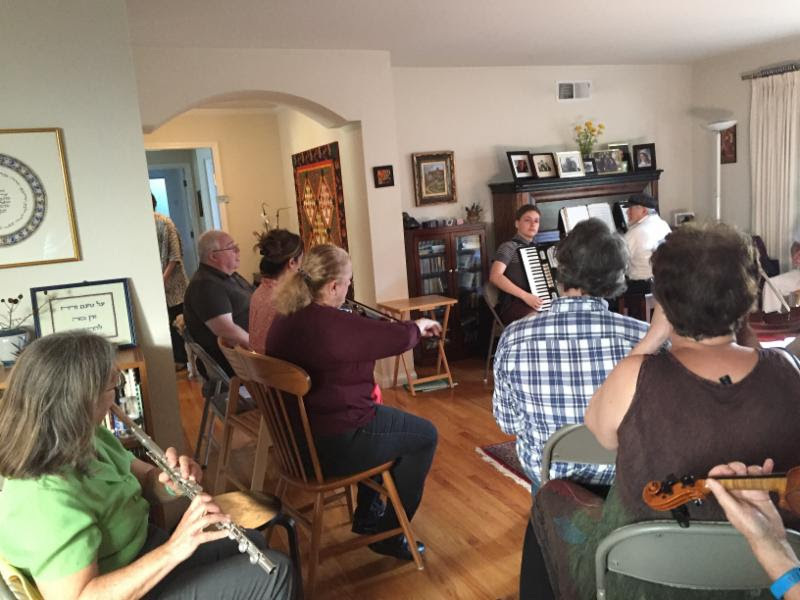 The klezmer workshop and jam September 25 in Berkeley were a great success! Eighteen people playing various instruments learned and enjoyed Jeanette's Lewicki's lead. With your participation (and donations! ), we hope to continue workshops and jams almost every month. September 25 jam in Berkeley. Photo by Les Plack. Session 1. Klezmer Instrumental Workshop for musicians with little or no klezmer experience but who are proficient on their instruments. 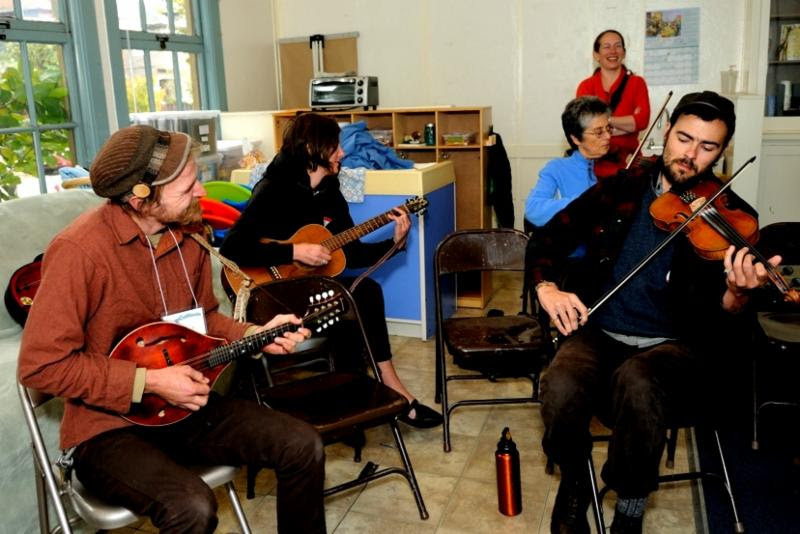 The workshop will include playing tunes with charts, getting familiar with klezmer techniques, and learning some tunes by ear at a slow pace. NOTE: Learning by ear is the traditional way to play klezmer and the best way to pick up the style. However numerous participants in recent jams have requested charts. Session 2. KIezmer Jam Session for those with at least intermediate familiarity with playing klezmer and/or jamming. After the leader begins the session with a warm up tune or two, musicians will take turns "calling" a tune, with everyone learning new tunes by ear or enjoying playing or improvising on familiar ones.The leader will provide guidance for pace, transitions, and ensure an overall smoothly run and fun afternoon! Reservations are requested at jams[at]klezcalifornia.org . Please tell us which venue you plan to attend, which session(s), and what instrument(s) you play (all instruments welcome). Listeners welcome as well. Donation of $10-$20 requested. KlezCalifornia will provide beverages and light snacks. 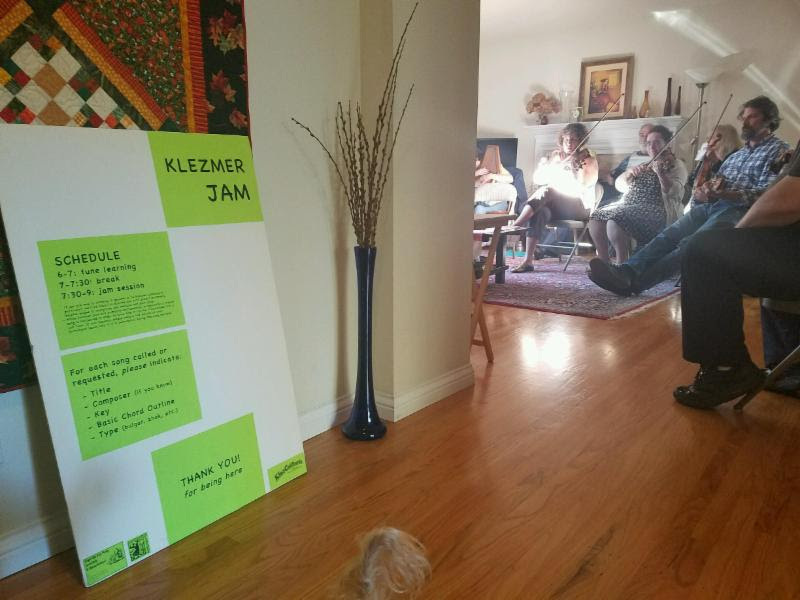 Participants are encouraged to check out the Klezmer Jam Session page on the KlezCalifornia website, including the resource links, and sheet music from the recent workshop in Berkeley. plays accordion with Saul Goodman's Klezmer Band. Having played piano from the age of five, Dmitri began playing the accordion a few years later. He has studied with accordion masters Josh Horowitz and Alan Bern. Dmitri has served on the advisory board of the Jewish Music Festival. By day, Dmitri is a computer programmer. has been playing klezmer music since 1992. 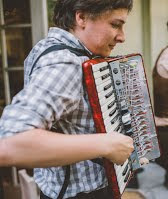 He has performed or recorded with the Freilachmakers Klezmer String Band, Davis Klezmer Orchestra, Klez Dispensers (of Colorado), Kugelplex, Red Hot Chachkas, and Saul Goodman's Klezmer Band. 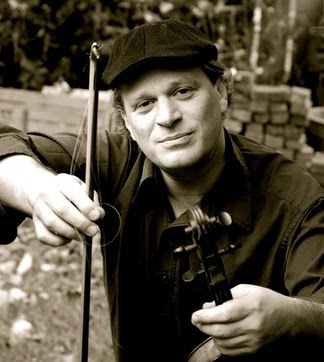 Dave's klezmer workshops focus on the feeling and personality of the style, including tempo, ornaments, improvisation, scales, modes, and chord theory. With a B.A. in Art, M.A. in Music Composition, and background in theater, Dave's approach is well rounded. He plays fiddle, mandolin, bass, and drums. To RSVP: 415.789.7679, jams[at]klezcalifornia.org. Please indicate which venue you plan to attend, which session(s), and what instrument(s) you play (all instruments welcome). More info: klezcalifornia.org/jams. Over the next year, we will try out several models of workshops and jams.Your feedback is critical, so let us know your preferences! at Art House Gallery & Cultural Center, 2905 Shattuck Ave. This venue is a short walk from Ashby BART. Session 1. 1:00-2:30pm. Klezmer Instrumental Workshop for musicians with little or no klezmer experience but who are proficient on their instruments. 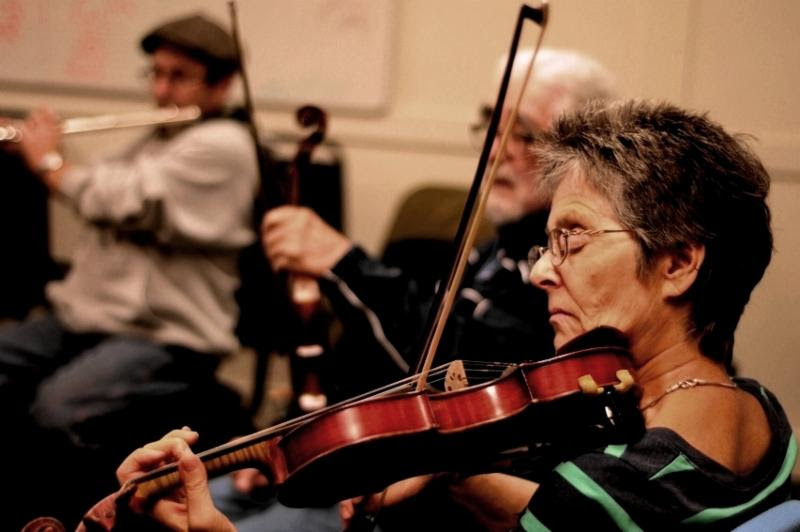 Taught by klezmer instrumentalist and singer Jeanette Lewicki, the workshop will include playing tunes with charts, getting familiar with klezmer techniques, and learning some tunes by ear at a slow pace. NOTE: Learning by ear is the traditional way to play klezmer and the best way to pick up the style. However numerous participants in recent jams have requested charts. For at least the next several workshops, we will include both forms of learning, with the exact mix determined by the teacher. Please give us your feedback. Session 2. 2:45-4:15pm. KIezmer Jam Session for those with at least intermediate familiarity with playing klezmer and/or jamming. After the leader begins the session with a warm up tune or two, musicians will take turns "calling" a tune, with everyone learning new tunes by ear or enjoying playing or improvising on familiar ones.The leader will provide guidance for pace, transitions, and ensure an overall smoothly run and fun evening! Let us know you are coming:Reservations are not necessary but are greatly appreciated at jams[at]klezcalifornia.org. Tell us what instrument you play (all instruments are welcome) and which Session(s) you plan to attend. Listeners are welcome as well. Donation of $10-$20 requested, but everyone is welcome. KlezCalifornia will provide beverages and light snacks. page on the KlezCalifornia website, including the resource links. 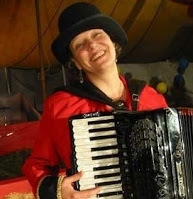 Accordionist/bandleader Jeanette Lewicki has played klezmer music and sung in Yiddish since 1987. She plays with the San Francisco Klezmer Experience (Klez-X), leads the gonifs klezmer band, and frequently leads rotating-membership bands at Porto Franco Music Parlor and at Revolution Cafe, including such stellar musicians as Sheldon Brown, Ben Goldberg, Darren Johnson, Peter Jaques, Lisa Mezzacappa, Stuart Brotman, Rob Reich, and Michael Alpert. She is heavily influenced by the teaching style of Dr. Alan Bern, founder of the Other Music Academy. Jeanette is the producer/arranger for numerous recordings including Mayn Shtetele Soroke (with Bessarabian Yiddish singer Arkady Gendler), Fli Mayn Flishlang (Yiddish children's songs by Beyle Schaechter-Gottesman), and the gonifs CD. Jeanette loves to teach, and feels she learns from every musician she plays with. Her teaching style is inclusive, enthusiastic, and informed. She encourages close listening, inventive arrangement, and learning by ear, as well as chart-based reading skills. For Session 1 she will share charts (Concert & Bb) of lesser-known klezmer dance tunes, including the dance forms bulgar, kolomeyke, zhok, freylekhs, and khosidl, and some tips on playing for singers. 415.789.7679, jams[at]klezcalifornia.org. Over the next year, we will try out several models of workshops and jams.Your feedback is critical, so let us know your preferences! We warmly invite you to the third KlezCalifornia klezmer jam session (and our first in Palo Alto)! Around 20 people have said they are coming, but there's room for more. WHEN: Sunday, July 17, 2016 -- 6:00 - 9:00pm. WHERE: Private home in Palo Alto. Contact us for address. 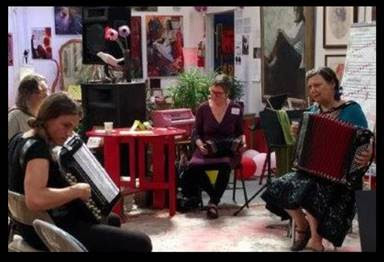 WHO: Musicians of any level, any instrument (klezmer experience not required), and people who just want to listen and enjoy. WHAT: 6:00pm - guided slow jam. 7:30pm - "regular" jam. Both will be led by Dmitri Gaskin. DONATION REQUESTED: $10-20, sliding scale. No donation required. RSVP: Email jams[at]klezcalifornia.org to get the address. Let us know what instrument you play and which session you are hoping to attend (slow jam, regular, both). A piano will be available. 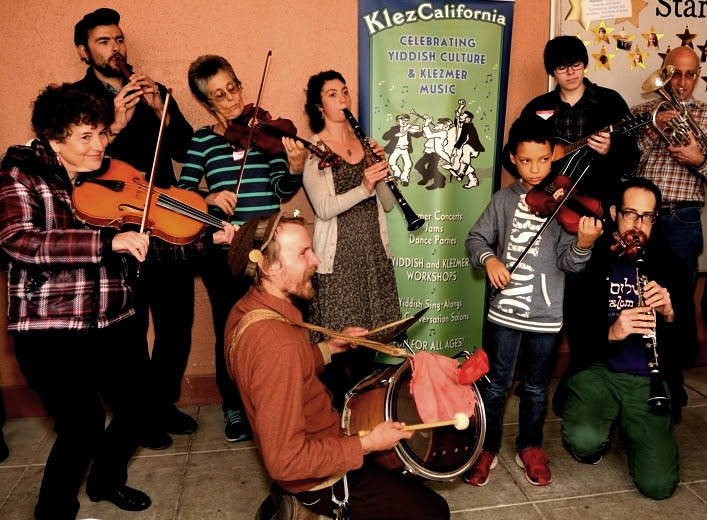 KlezCalifornia warmly invites you to our second klezmer jam session! WHEN: Sunday, May 1, 2016 -- 12:00noon - 4:00pm. 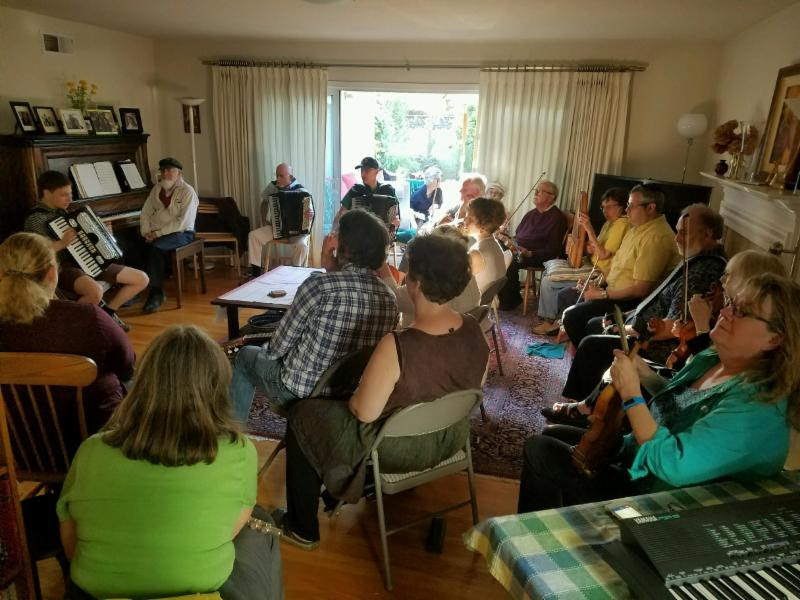 RSVP: Rsvp's welcome, but not needed, to jams[at]klezcalifornia.org. MORE INFO: 415.789.7679, jams[at]klezcalifornia.org, Event Facebook page. Photography by Lea Delson, delsonphoto.com. 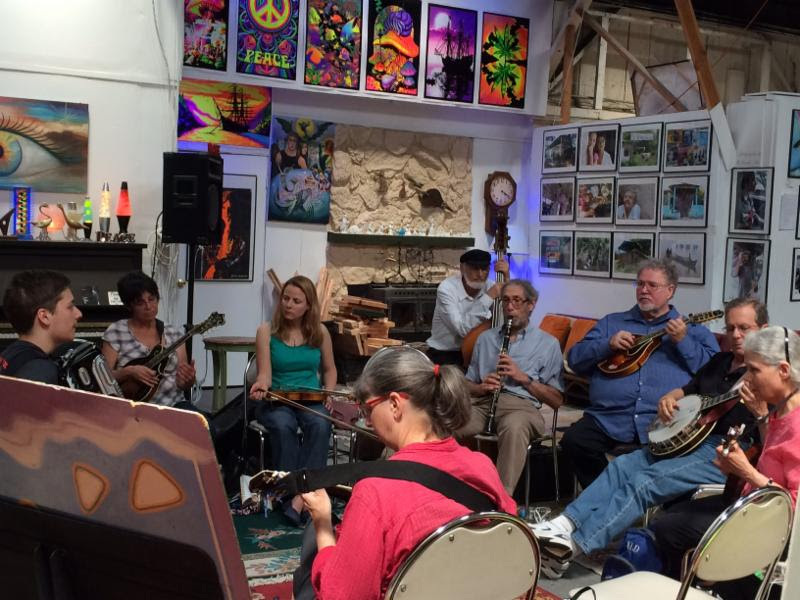 Sunday, December 6, 2015 -- 3:00-8:00pm, Klezmer Jam and Khanikeh Party. KlezCalifornia is sponsoring a klezmer/Balkan/etc. jam and party for musicians, singers, and dancers, led by Peter Bonos, trumpet and euphonium player and member of Orchestra Euphonos and Fanfare Zambaleta.